The Pentek EPM-10 replacement filter reduces bad taste & odor and chlorine taste & odor (based on manufacturer's internal testing). The Pentek EPM-10C replacement cartridge has low pressure drop. 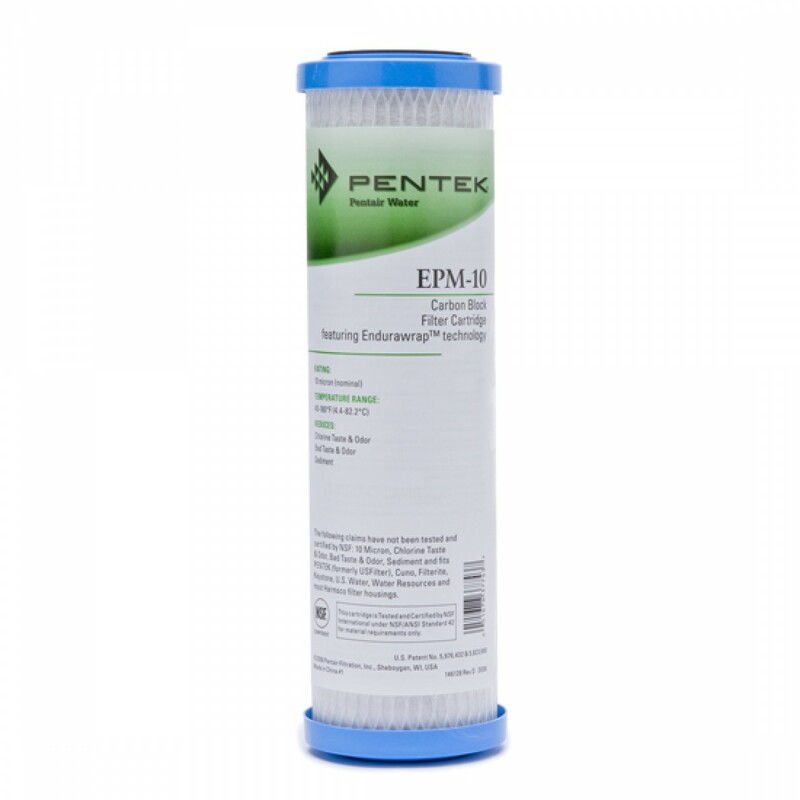 The Pentek EPM-10 filter cartridges are manufactured using a patented process that yields a cartridge with a nominal 10 micron filtration rating, high porosity and chlorine taste & odor reduction. The high porosity design helps prevent the cartridge from plugging before its adsorption capability is exhausted, maximizing the utilization of the carbon while maintaining low pressure drop. 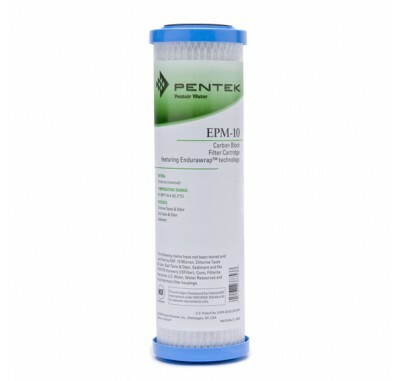 These Pentek EPM-10 filter cartridges are protected by Endurawrap, a uniquely formulated polyolefin bilaminate prefilter, designed to significantly increase the useful life of the cartridge by trapping sediment that typically plugs carbon block cartridges. The Pentek EPM-10 filter cartridges are manufactured entirely from FDA-compliant materials making them an ideal choice for a wide range of residential, food service, commercial and industrial applications. NOTE: Do not use with water that is microbiologically unsafe or of unknown quality without adequate disinfection before or after the system. NOTE: Filter cartridges will contain a very small amount of carbon fines (very fine black powder) and a new cartridge after installation should be flushed with sufficient water to remove all traces of the fines from your water system before using the water. Each time you use your filtered water tap for drinking or cooking purposes it is recommended that you run (flush) the tap for at least 20 seconds prior to using water. NOTE: Performance capacity depends on system design, flow rate and certain other application conditions. The Pentek EPM-10 water filter is the same as the Everpure EV910916 water filter and the Pentek EPM-10C water filter. Pentek EPM-10 water filter cartridges are a modified version of the EP Series cartridge. An economical price makes this cartridge suitable for taste, odor and chlorine taste & odor reduction, as well as sediment filtration. NOTE: When greater chlorine taste & odor reduction is needed, use the EP-10 water filters. 155634 Pentek EPM-10 filter fits in housings for 10 inch water filters. 3. Discard used filter cartridge. 4. Wash housing with dish soap and warm water using a nonabrasive sponge or cloth. Rinse thoroughly. Fill 1/3 with water. Add about 1 tablespoon of bleach and scrub to disinfect. Rinse thoroughly. 6. Lubricate o-ring with clean silicone grease. Change o-ring if any damage cuts or degradation are present. Insert o-ring in groove. NOTE: This step is important to ensure a proper housing seal. Make certain the o-ring is seated level in the groove.